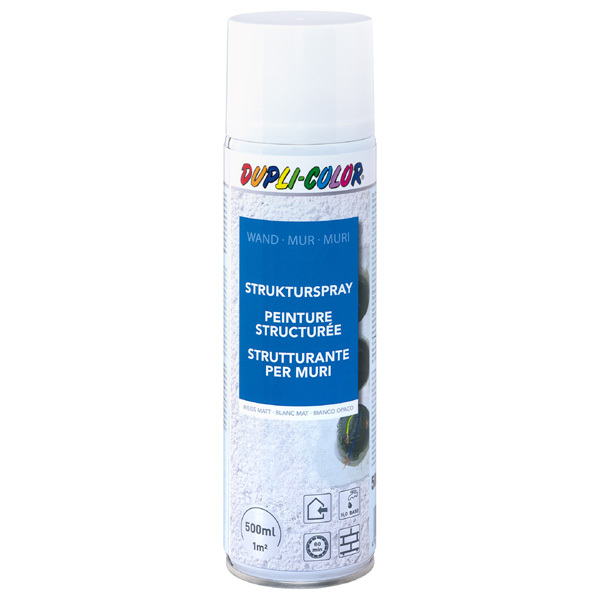 DUPLI-COLOR Structure Spray creates an individual surface structure, similar to a rough plaster. It is an exclusive, water-based polyurethane dispersion, which is suitable to repair and adapt a textured plastering. It can be used on misc. surfaces, such as concrete, gypsum plasterboard, sheetrock, wood etc. Can be overcoated with all dispersion paints. If there are water stains, smoke or grime spots, we recommend to use first DUPLI-COLOR Blocking Primer. The surface has to be dry, clean, free from fat and wax as well as sanded. Shake can vigorously for 3 minutes and test spray on a carton or a wooden plate. Spray from a distance of approx. 25-30 cm. Spray in circular, permanent movements. In order to achieve a thicker structure, spray again and let the spot dry. Turn can after use upside-down and spray several seconds, in order to clean the valve.